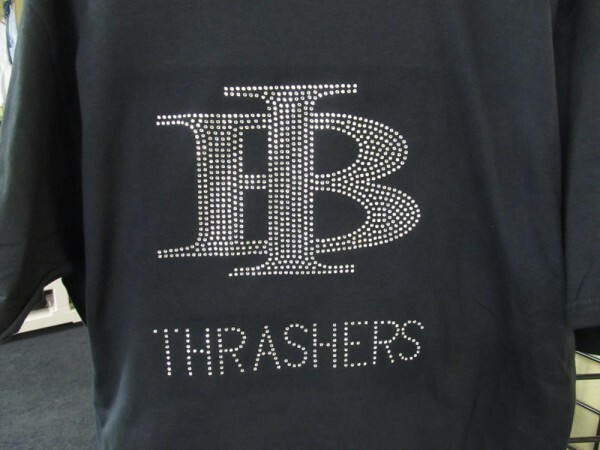 The most common question about rhinestone t-shirt systems: Will I Make MONEY?! 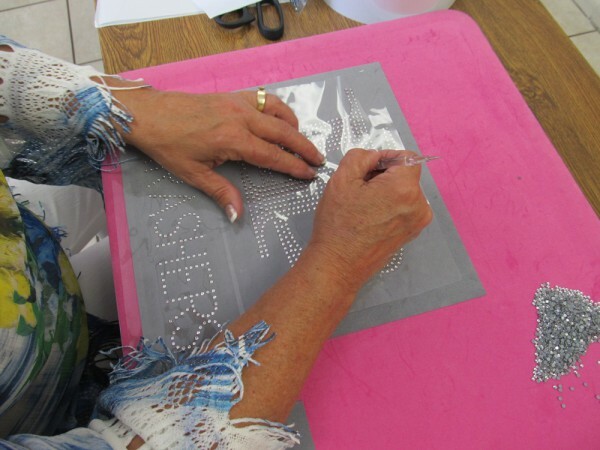 We get questions all the time about getting into the Rhinestone business, whether it’s adding rhinestone transfers or t-shirts to an existing shop or starting from scratch. While we don’t have a crystal ball, we do have some pretty compelling numbers for you related to rhinestone costs, t-shirt pricing and a specific example that should help you to make your own judgment. Our companies sponsor a Little League team locally (going to the ChampionshipsJ), so we’ll use this transfer for our calculations. Your Brush n Bake comes with a 14.5″ X 5 yard roll of Sticky Flock template material. Separately, this costs a little over $131. This works out to 2,610 Square Inches, which makes your cost around $.05/sq inch. 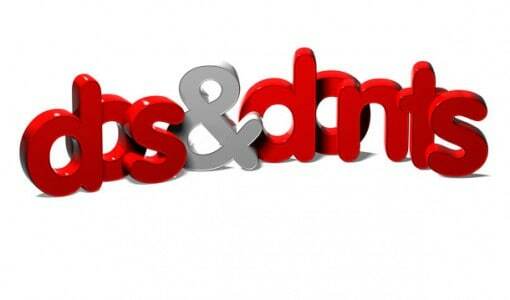 The design we did is 8.5″ X 9″, so you are are going to spend $3.83 on the template itself. Keep in mind that you only have to create the template ONE TIME, so you get to amortize the cost over the number of t-shirts you produce and sell. 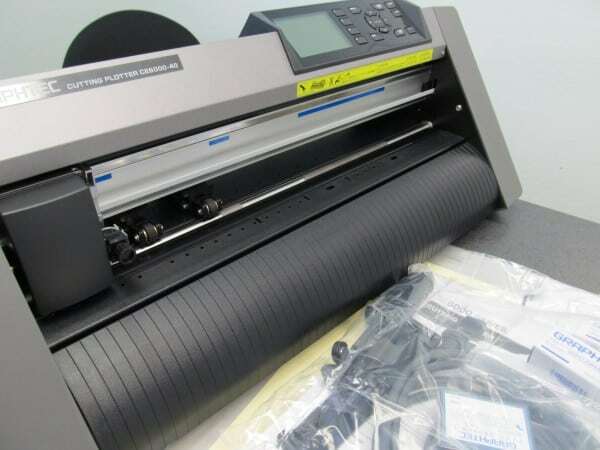 So at this point you have created your design, and cut it out on your Graphtec CE6000-40 Plotter that comes with your system. (see that device here). Guess what’s next? Your Brush n Bake comes with, among a great selection of other rhinestones, the ever popular SS10 3mm hotfix crystals. Colman and Company provides you with a 50 gross bag,which is 7,200 Korean made crystals. These stones are a stunning quality and are often confused with much more expensive products. 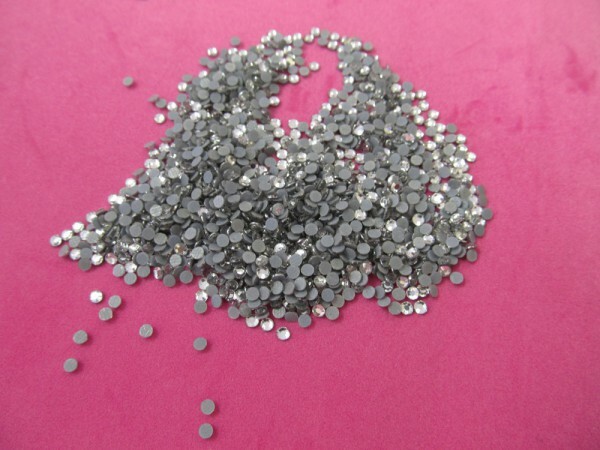 The 50 gross bag of Crystal SS10 Rhinestones sells for $18.20 at ColmanandCompany.com, so your cost per stone is a miniscule $.0025 each. 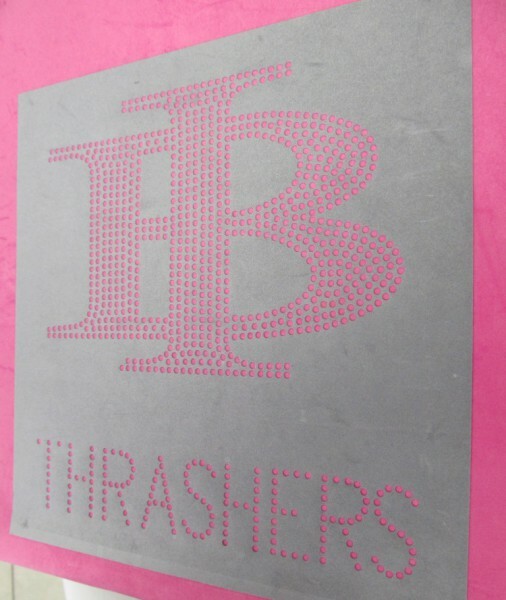 The “IB” Thrashers T-shirt design contains 1,507 stones, which is about 3 times the average design, for a total cost of $3.80. So far, your total cost is $3.83+3.80=$7.63. .but that INCLUDES the Sticky Flock! Your next expense, after you brush those rhinestones into the flock, is your..
Also called Hotfix Tape, Silicon Tape and a few other things, this is a roll of material that is sticky on one side. Just peel off the sticky tape from one side, then lay it carefully over the design. When you peel it up, it brings all those rhinestones with it to make your “transfer”! Your Brush n Bake StarterKit-HP comes with a 7″ X 100m roll, which is 27,559 square inches of material. That product sells for $86, so you’re cost is about $.003/square inch. Once again, our design pictured above is 76.5 square inches, so the cost of the transfer paper you will use is $.24. So now, with your transfer paper, rhinestones and sticky flock, your total design cost is $7.87. Remember, you are only spending money on that StickyFlock for the template one time. 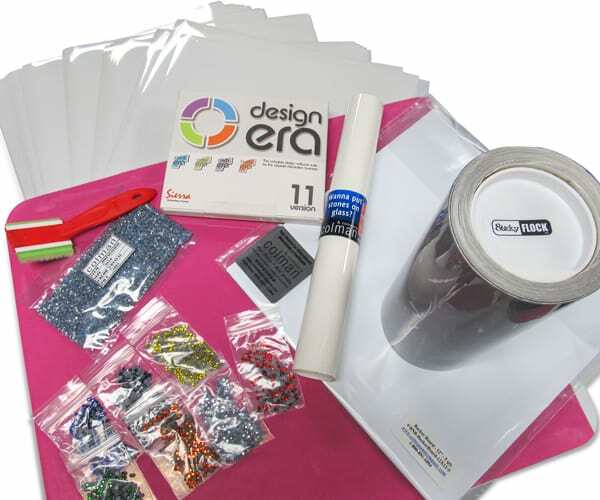 After you create your template, your cost per transfer is just the rhinestones, the transfer tape and your time. 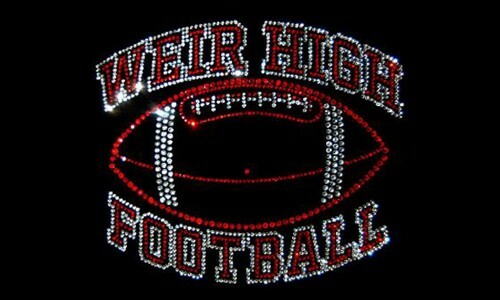 This HUGE, custom rhinestone transfer #2 will cost you $3.80 for the 1500+ rhinestones and $.24 for the transfer tape. Total = $4.04 We recently got a quote on a slightly smaller transfer with 2 colors for $14.00 each for 1-11 units. If you just charge $10, you make almost $6.00 each. Now.. if you’re in the Wholesale Business, your process can stop here. Wholesalers may do custom design work like we did for Interbay, but then they just send the transfer to their customer, who heat presses onto a shirt themselves. 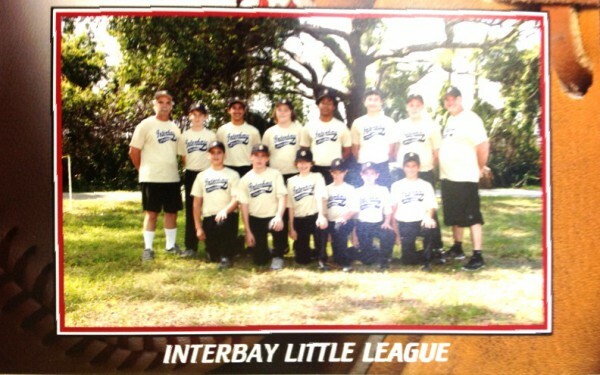 Let’s take another look at the Interbay Thrashers end product. Total cost for transfer #2 is just $2.91. So now, the only thing between you and your customer is a T-Shirt and the use of the Heat Press that came with the System (if you got the HP). The price you can get for blank T-shirts, or “blanks” as they are called in the business, varies by quality and quantity you buy. Best case scenario is around $3 each, worst is about $5, so we’ll use $4.00 for our sample cost. So now your cost for transfer #2 PLUS a T-shirt, and everyone there after, is $4.00+$4.04 = $8.04 for a finished product. Your system cost you $2500, so you will have to sell 147.40566 of these T-Shirts to pay for your system! That’s 50 shirts a week for 3 weeks. That’s one really BIG family reunion shirt sale. That’s one Church Sale, or a School Fund Raiser or a few good days at the Saturday Market. Frankly, it will be MUCH easier to produce a great Return on Investment with a smaller design, and you COULD easily sell a shirt like this for $30 each. We used a “worst-case-scenario” here to help you see all the potential the YOU and the BRUSH N BAKE Systems have! 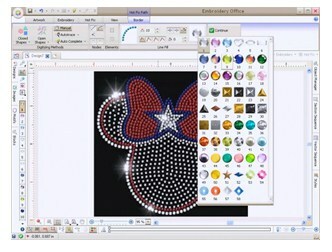 For more information on the Brush n Bake and Rhinestone Transfer business, there are lots of articles here, or you can visit http://www.colmanandcompany.com. If you’d like to see the Hotfix Era software in action and some videos on the Brush n Bake, the visit us on YouTube. Best of All – stop dragging your feet and get started TODAY. Buy Now. 7 Things you need to do before starting an embroidery business.